Not a striking Barcelona picture but a photograph about our customs, our people, one of the most popular games among our elders, La Petanca. The Greeks and the Romans were known to play with stone balls, and variants of those games were the origin of modern bowling, curling or in this case, "petanca". It was brought by sailors to Gaul or Gallia. Stone balls eventually became wooden balls and at present are made of steel. By the end of the XIX century it was played regularly in Le Midi, France. In fact, the name "Petanca" comes from French "pieds tanquees" (tight feet) as players must remain in that position when throwing the ball. It is simple in appearance but complex depending on who and how it is played. You must throw your ball pointing at a small wooden ball called boliche trying to stay close to it . It can be played between two or in groups, the one that leaves the ball closer to the boliche wins a point each time until you get 13 points. The image of retirees playing in Barcelona squares is as familiar to us as that of pigeons. This photo was taken this spring at a park in the district of Les Corts. bacci ball, petanque, la petanca ... is it all the same game, I wonder? I think so, I just know we did not invent it and that it is very common in Europe. I don't know about Bacci Ball. It seems that you know about it too. i've seen elderly men play and i really admire their patience and skill. wonderful post carlos. We have Italian and Maltese people here in Melbourne who loves these games too. Actully I play with my kids with a small indoor set. Looks fun...have you tried playing it? Funny that you chose this theme, Carlos. 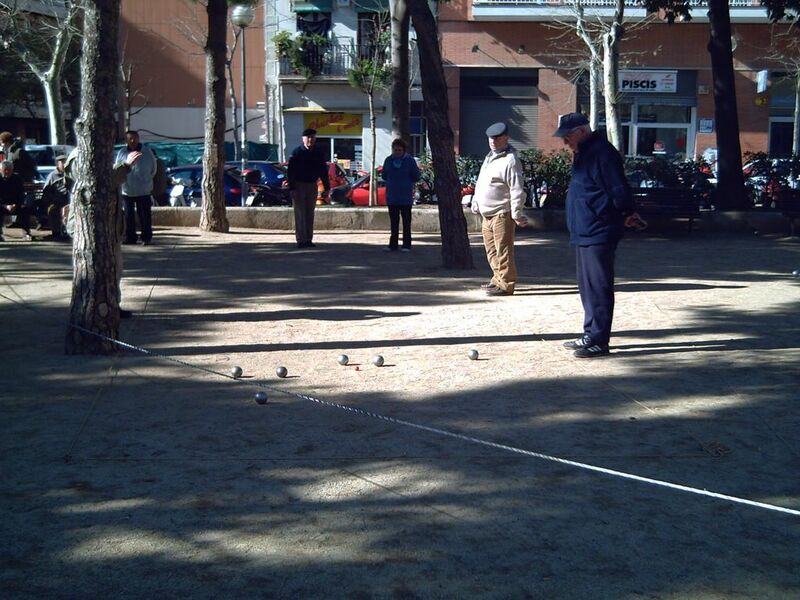 I recently had to translate a text on petanca and its countless versions, derivates and related games: bocce, petanque, lawn bowls, bolos montañeses, etc... I really had trouble to find out about this game, congratulations for this post! It looks like a lot of fun and a great way to just hang out with the guys! I just got back from London where I saw people playing boules in a tournament.